One of the peeves I have with the Blues band is that the leader, the person who the band is named after, never has a list of songs we are going to do. Beside not practicing, which I have said before, but having a song list is a simple thing and takes only a small effort. It looks very amateur to be on stage and say “ok, what song are we going to do next” especially to me, I am his Bass player as I have heard him say on several occasions. So we have another showcase at Overheat and before that I say after being ASKED if I can make it. Ok, I can, but “Be sure to know what song we ae going to do before we get on stage”. His reply to me is “and be sure to check your tuning before you get on stage” !! WTF! The reason being that he has had to wait sometimes for me to check my tuning before starting. He is always rushing to start, at times even before I am fully setup. The TIME to check one’s tuning is before starting, that is part of one’s setup time. You do not wait until after you have started to check tuning. You do not rush to start, then find out you are not in tune. Ok, I just say “right”, because it is not worth it to get into a fuss. This guy is a Doctor, not a pro, or semi pro. Never played with a close to pro group. He is just there for fun. Speaking of which I notice that it is pretty common here, for folks just to be playing for fun. No thought of being discovered, getting a contract, getting a gig, it is just fun. Different from the states, it is fun but also fun with a purpose a goal, a dream, a hope. Many of the players here, at least at the places the Doc plays at are just about fun. As I said before sort of like a live music Karaoke. My dreams of being ” discovered ” are long over but I would like to sound good, get a regular gig, make a CD, play some original songs, grow musically, something! I was speaking with a friend, a singer the other day, she has her own band. I mentioned that yeah, I heard a recording of our band from the Chicago Rock owner. 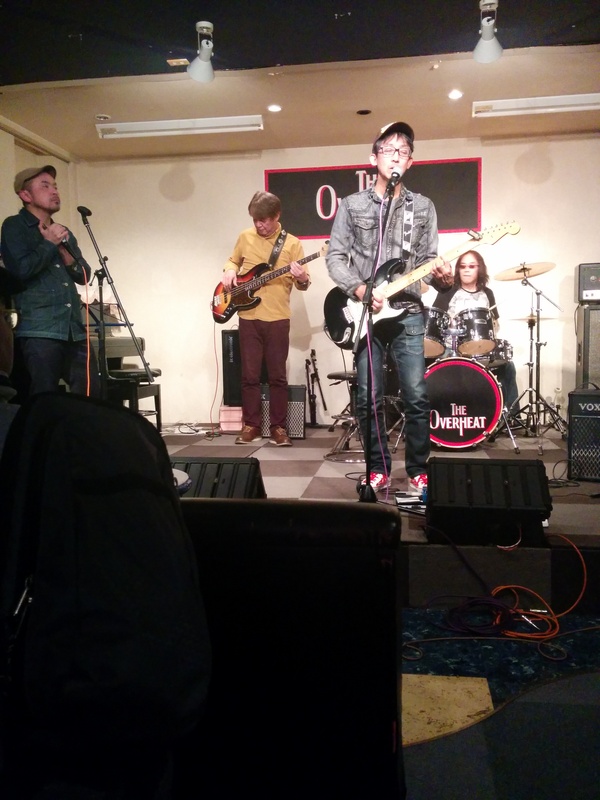 I was surprised we actually sounded pretty good on a couple of songs, for a band that does not rehearse. She laughed and said, yeah, a lot of people here are just out to have fun playing, not really serious about what the are doing. I said hmm, drives me nuts! rehearsal is not always fun but it is like practice of any art, to get better one needs to practice! It is a different world here. So we are there waiting for our turn, I am watching as everyone that comes up checks their tuning once they are on stage, setup and just before playing. I said nothing, but I am thinking see dumb azz, people tune up on stage just before playing. One can turn before going on stage, but tuning pegs get bumped, strings change tension with heat and cold, crap happens. So we are on stage and first song up he says I want you to sing. Ehhh! I say, do not want to start first. He says why not? I take a breath and say ok, rather than get into it on stage. Not a professional way to do things. We sat there watching the other bands for 2 Hours, and he could not say something about wanting me to start! WTF! Grrrrrrrrr! Ok, I am thinking, this is BS, I need to change this up. So I say, ok, lets have a few of the other musicians who were there also come up and join us. 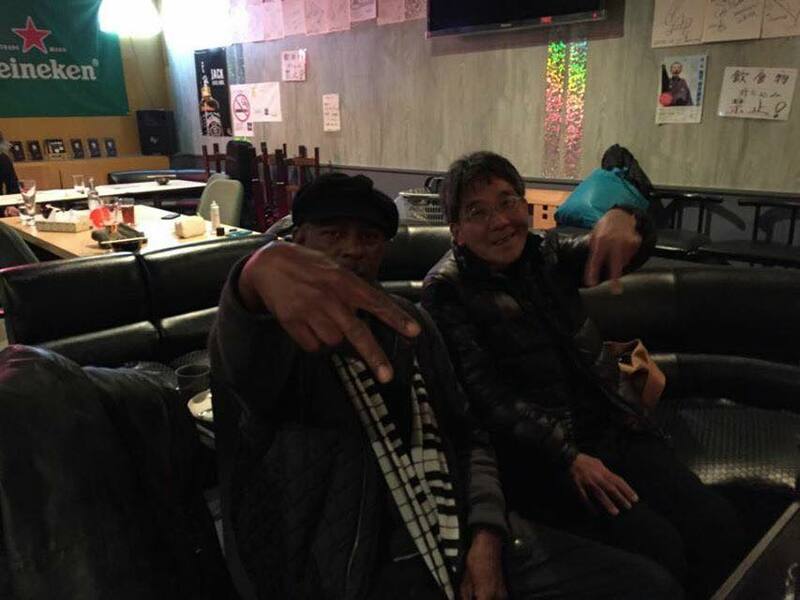 A drummer and another guitar player, a good jazz guitar player come up. It was a little rough at the start finding the groove, but it turned then into fun after we got our Mojo working together. It made the night worthwhile for me. So with the last two songs, which I had to pick and sing, it turned my mood around. Things started bad, but ended well. However, yeah it is time for me to seriously think about another band. It was sort of worthwhile when this band was getting a regular gig at Chicago Rock, but that has fizzled out, because we have no draw. Now that, that is over…time to reconsider things. Maybe I will just quietly start being too busy with other things to make his showcases. Yeah, I am pretty frustrated. Perhaps I need to kick up my Chan training practice a noch! It really feels like a dead end with this “band”, however at least I am meeting people, making connections. 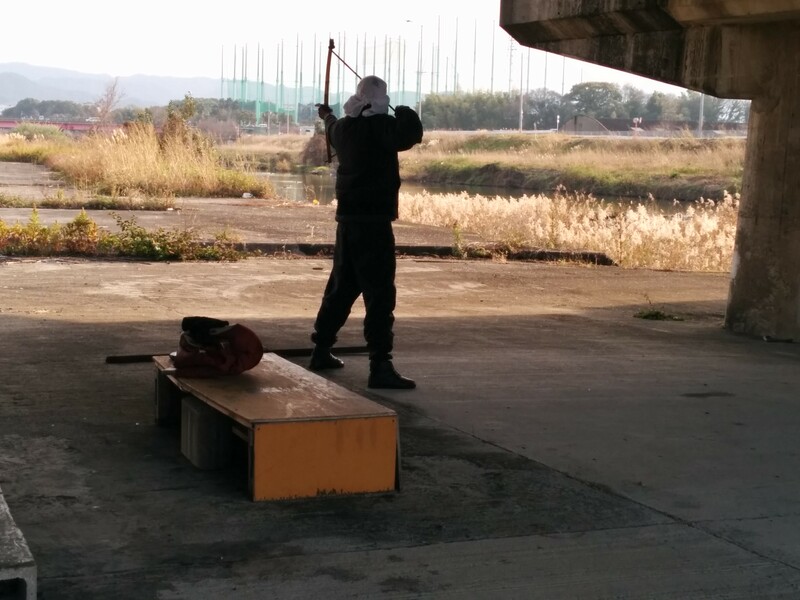 The first shooting of the year at Kishiwada. I attended last year, but it was different this year. At least the beginning. This caught me off guard at first…. However, before I get into that, it was a cold day. Not extreme , but cold. 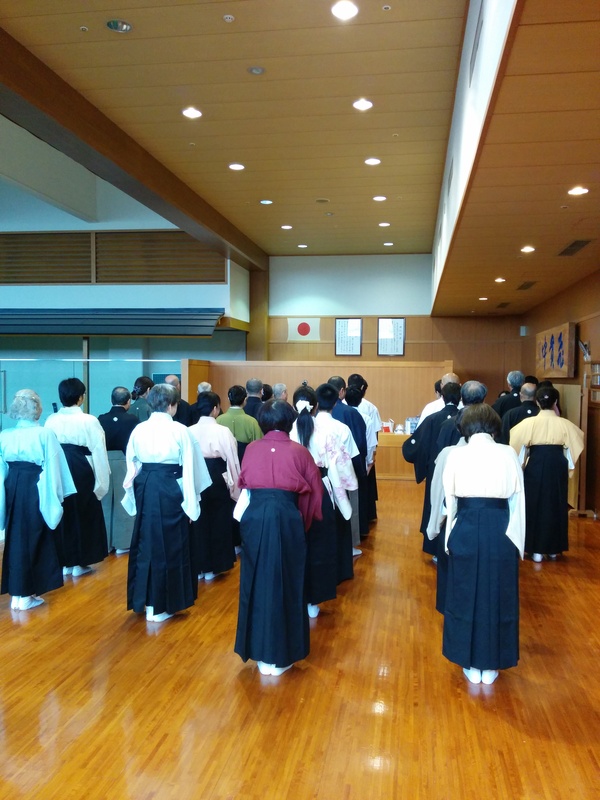 Most people there had dressed for the cold and some continued that flow even into the dojo, which is inside. It was interesting to see the people bundled up. Me who can not stand cold, I had layers upon layers, including my feet which had on heavy socks and my tabi. Silk thermos, dogi, plus kimono, yeah I was ready. I planned ahead today and wore my kimono to the Dojo, on the train. I covered up with my long coat, so not to draw too much attention. This way I did not have to change at the Dojo, which is not a big deal , but it made life simpler showing up ready to go. Things started with announcements and a couple certificates given out, a new 6th dan and a new Sensei. There were also a bunch of small awards for points, but I had no idea what that was about. After the opening Sharei I was expecting to have a regular tai kai style shoot. Wrong, it was more at first like a Shinsa, with five shooting at a time. Oh boy! I had to think fas i had not learned the standing form as yet , and I was unsure of my knees could handle it. Making things worse I was ochii!! 😦 last n my lineup. I watched and thought. Then I noticed there is a classmate who does the standing form. I watched her carefully, afterward I questioned her and practiced. I am thinking, it is a good thing this is a low key event. I came across the Kaicho in the hall ( on purpose) I questioned him further as a way of review from what my sempai had told me. He went through it with me, then said something about checking with someone. Turns out he got the sempai from earlier to coach me on the floor as did the Tai Hai. Yokatta, it was not bad though, I did ok. It was easier being last so my timing was not so critical! Yokatta! I have a month or so to perfect it now before the spring Shinsas. Anyway, I hit one of my two shots. Not great, not bad, unless I was testing, but that is another story. 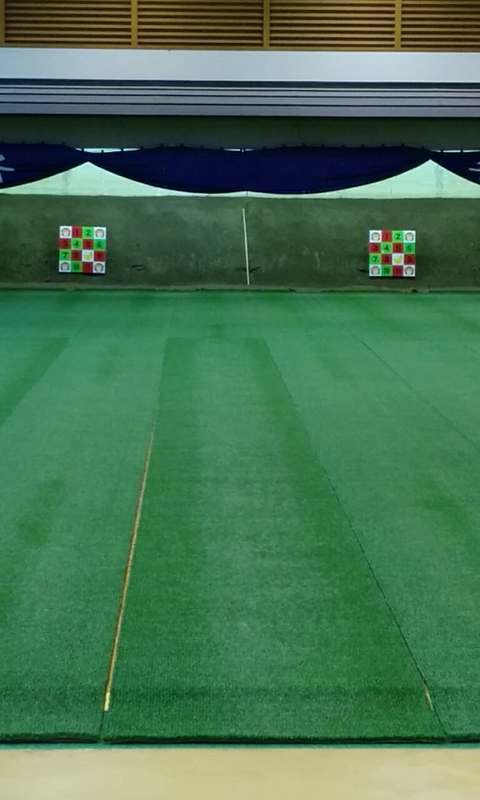 See that my shots hit on the center line, both of them , one was just way to high. So there is progress but improvement is needed…still…for a long time, always actually even the Senseis take guidance to improve. After the Tai Hai shot, came the small target. A piece of diamond-shaped wood, placed closer to the shooter. When hit it breaks and sprays silver something in the air. Kind of mess, they put paper on the floor under the target and stand. I missed both of those shots. One by not much, but that does not really count. As Yoda would say, you hit or you hit not. I hit not. Next up was the bingo shoot. This is interest and hard. The gave an explanation on something about the scoring, however I had no idea what was going on. There was one spot that was marked that I gathered was a big deal if you hit. 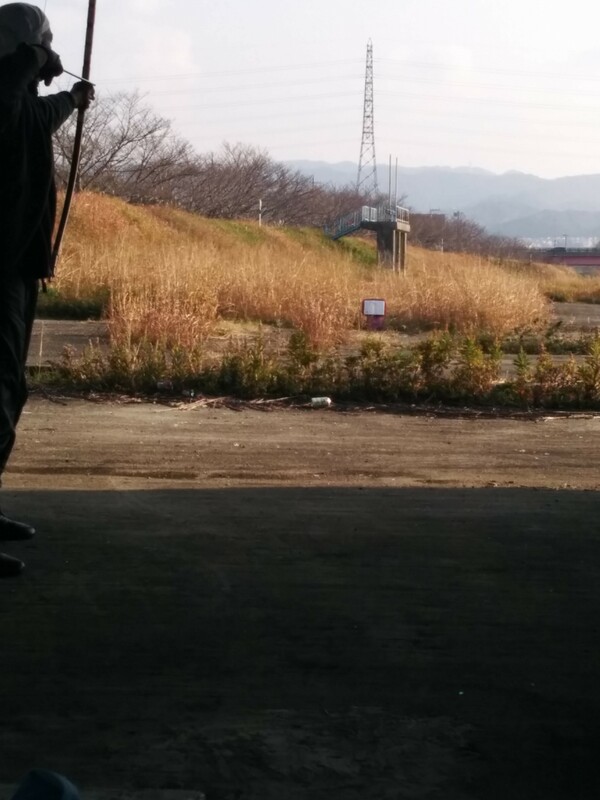 I just went up and shot with my group, afterward Yamashita sensei said something as I was coming off the line, that sounded positive, but I had no idea. I was quite surprised later to find out my group had won something. Not first but second place I guessed. The first group called up got the pick of the prizes. Sets of Ya, ya cases, misc. I chose a bamboo Makiwara Ya. My first win at anything. This could be a good omen for starting the Kyudo year! 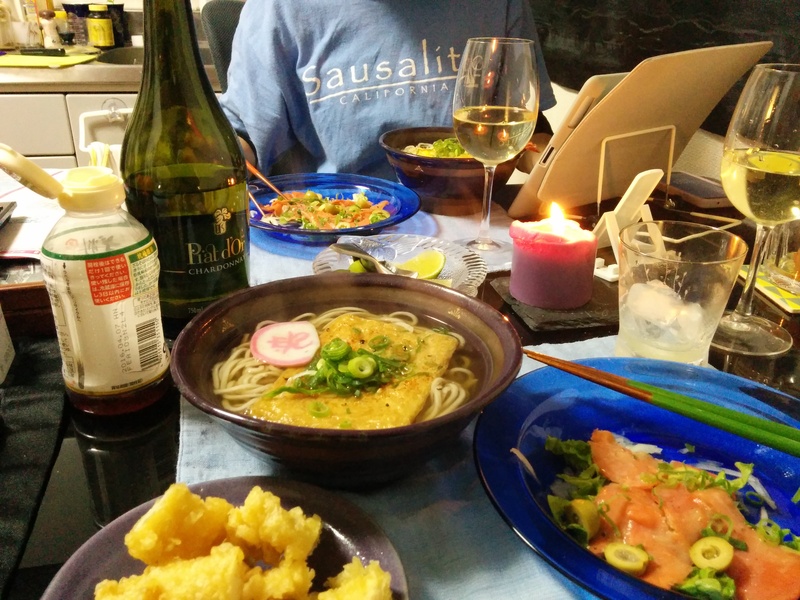 I had Shakuhachi class the other day. It continues to be interesting. Last month I did a demo/ test song, using my keyboard with drum beat as a backup I played Shakuhachi along with the track. 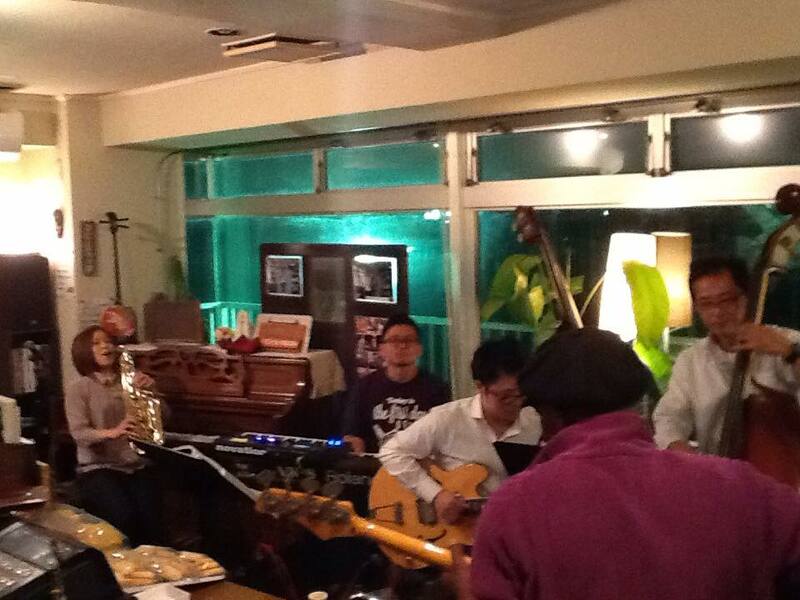 It was kind of a Jazz mode. It was only so so. Mostly me testing notes, breath, etc. i played it for Sensei, his remark was this is a good way for you to practice. My technique said was not perfect but my “feeling” was good. Now he is saying he is looking forward to hearing me play live and strongly encouraging me to play in this mode. 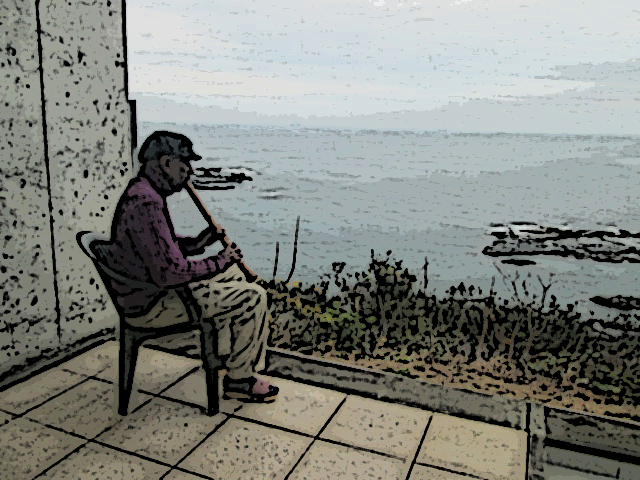 Playing blues is a good mode for the Shakuhachi. I told him i was working on it. I had some song ideas but my skill is not there yet. He said do it! I have been getting a better feel for playing and adjusting my pitch. I am thinking, soon maybe by Spring i may have it together enough to try a piece in public. I know my parameters better now. As far as lesson I am starting on the third octave for some notes. Still I need to practice more reading in Japanese. On another note. I had mentioned in my last Shakuhachi post about the kumoso monk in Kyoto. Well I did hear from him. He was very apologetic about not replying sooner. Seems like a nice guy, answered a few questions I had and offered to show me a few places in Nara off the normal tourists path. Another thing about my class is I get interesting historical data on the Shakuhachi from Sensei. I especially enjoy the Zen tie in from the old history view point. There is also modern history, for example, John Coltrane went to Japan to learn Shakuhachi. 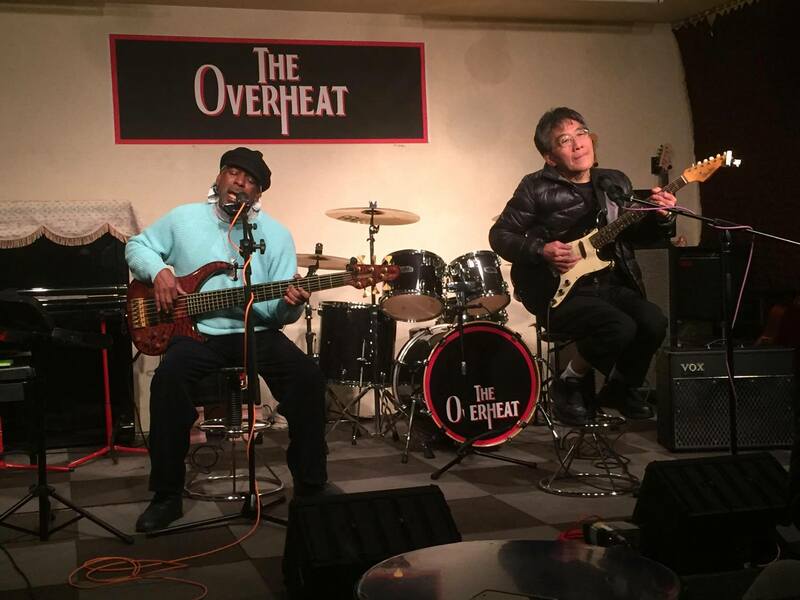 It maybe that I forgot, hmmm, anyway, last Friday I got a message from the Doc that the Band, he was scheduled to play at the Overheat Club/bar again the next day as well as end of the month. Ok, works out I am free. After working on Sat, doing a winter sail with as the Captain in a practice day sail with the Tajiri /Aoki Yacht Sail club. It was a miserable day for me. 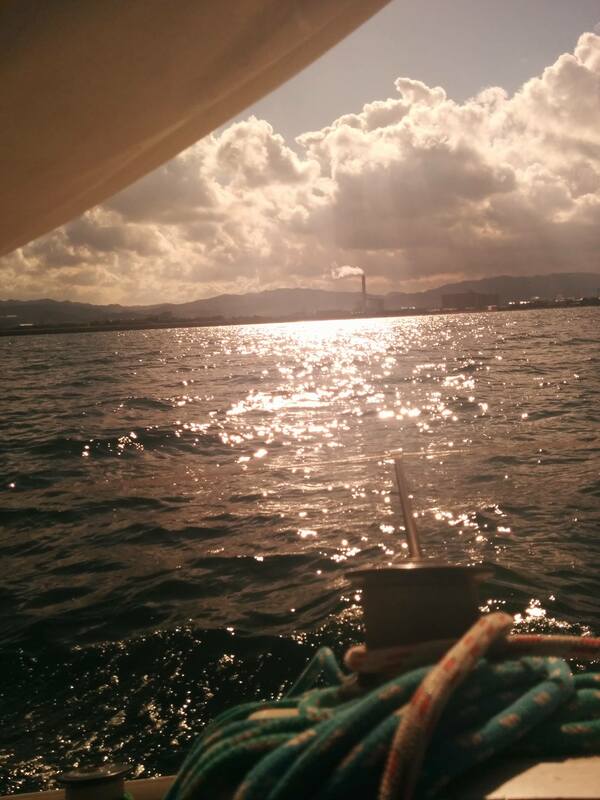 The weather was good for sailing, fairly steady 11 knots or so wind, with medium gusts. Sea were fairly smooth and on the right heading we zipped along even under a reefed sail. It was a comfortable ride. However , there is always a however ne, it was a cold wind! I was dressed for it being cold, but even then I was chilly. I hate winter sailing! However that is another story…. I made my way to the club after work. I found out before leaving we were not first up playing. I relaxed some since there was no need for me to rush over. As it was I could have hung out at home for even longer. It was at least another 1.5 hrs before we got called. Most of the other acts are cute , but kind of boring to me. 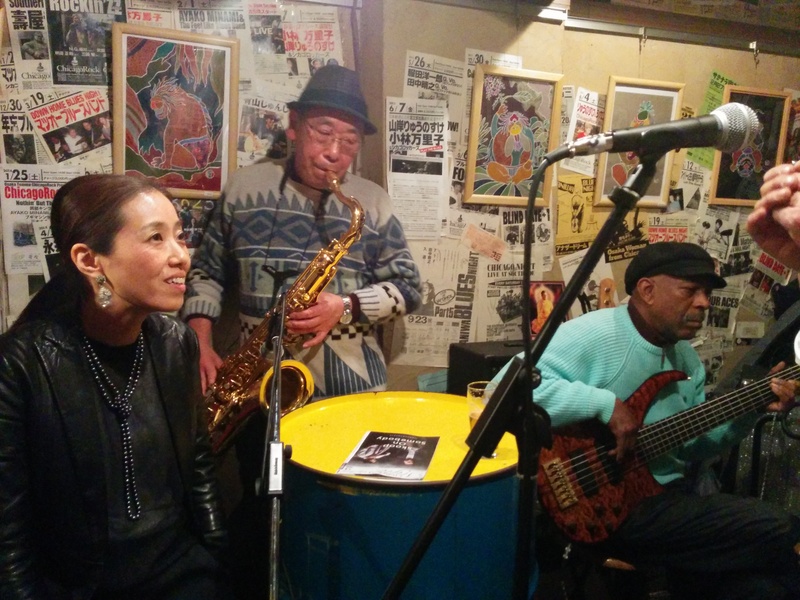 Tonight there was another blues band. They were good! The singer, not so much, but the band was good. To me, put us to shame. They did a couple of song we do, so I got to compare directly. They did four songs. All songs pretty tight and ended together, started together. That in itself is a big deal. What made it worse in my eyes is they had the same instrument setup and sounded better musically. 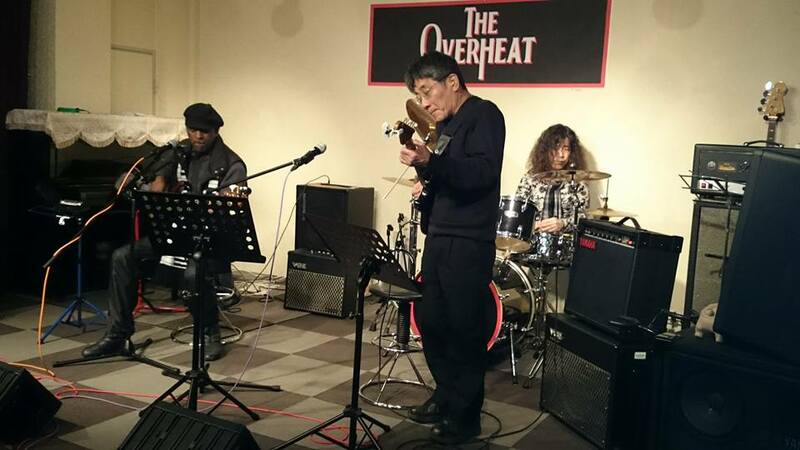 Funny the lead singer stand it was his first time playing blues in front of a “gaijin”, so he was sort of nervous. Hahah funny. There were a few other couple and single performers up before we went up. Different types of music. There was a Monkees song in Japanese I enjoyed, because I like the song. There were a few rough spots in the performance, but mostly it was ok…considering. At least not face losing. It is different playing in front of a bunch of other musician than playing in front of people just out for the evening. Speaking of people just out for evening, there was a group of friend there from Pakistan. About 6 of them, i think one of them was married to the Japanese with them. They sat in the front tables right next to the band. They were all pretty stoned faced, maybe because they felt like strangers in a strange land. One of the performers remarked jokingly to them they were sort of scary, just sitting and looking cold faced. Then mimic them. They laugh, a bit at that. But yeah, I understood how he felt. Ok, so over all the evening was ok, parts boring, parts interesting, our playing not too embarrassing. Once again got to see some different players here in the Southland. I believe we are supposed to play again end of this month. I will plan on picking two songs better and making sure about the key. I know I will have to sing at least one. What I need to do it do a song in Japanese at least one verse. 1. It is very acceptable to use sheet music for playing. In the states, no no no, once in a while is ok, more so if you are playing for someone else, but not for your own band. 2. The attitude is different about playing just to be playing. Hard to explain that one. In Short, good or not it is acceptable just to get up a play, to do your best. Seems like many of these open mic type things are more like a live Karaoke. I have been asked to come jam with the group at Snafkin end of the monty. This is the group with the female Sax player, it was fun with last time. This time I will be more prepared to tape something. 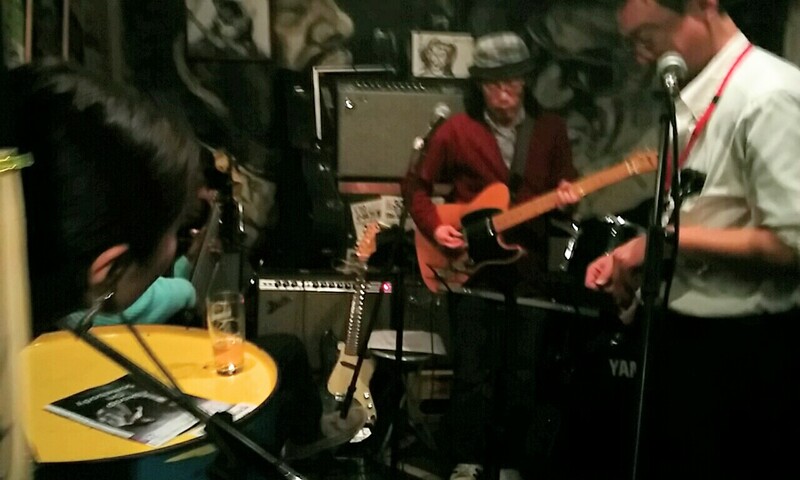 We sounded good last time the small bottle of sake helped I am sure, still these guys are good players. I want to play something cool. I would love to get with them on a more regula basis and do some songs, even though they have a Bass players and do mostly Jazz. 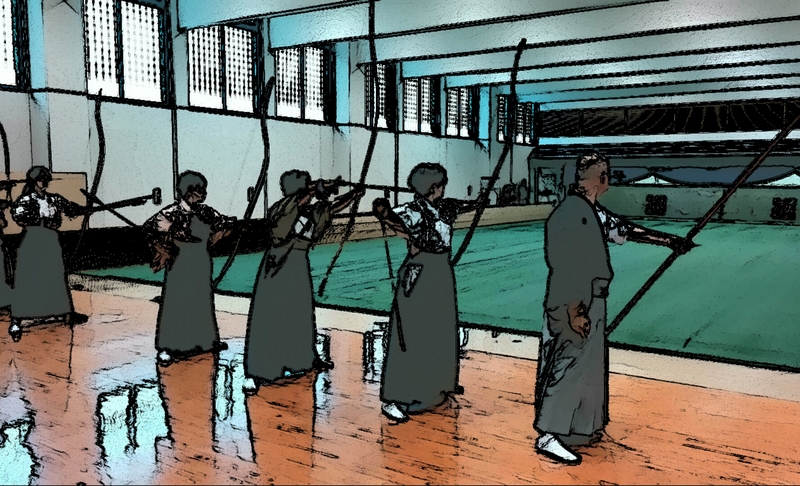 Also there is the Kyudo musical ensemble. That has been postponed until April as the club is booked until then. I also want to get with the ladies who do the Okinawan music again. I would like to do some bass with them as well as some Shakuhachi. I think the songs are simple enough that I could play Shakuhachi ago with them. The Shamisen part is very simple, so perhaps I can improvise also following the basic musical score. Well later anyway. Snafkin is still my favorite venue, I like the vibe there. I have not said anything else about having the Doc play there again. It is kind of nice not being “his” bass player. Hmmm ego? Yeah, sound like it. Oh well. Sometimes it is ego that drives us to improve. It can be a good thing. As it is said, sort of in Zen, everything is neutral it is how we perceive, use things that make it good or bad. I had been giving some thought to a practice spot closer to home where i could do 28 meters. There is a lot of open space next to the river near my home. The other day just after New Years i went exploring what. I thought would be a good spot. I marked. 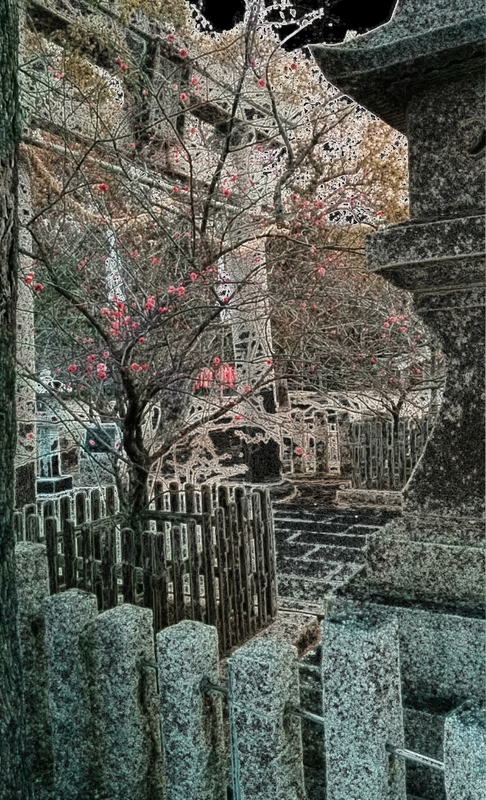 It off and took a virtual shot with my gomiyumi. I planned to return and do an actual shooting. Today , a couple of days later after the family New Year lunch I took my equipment in for a real test. I set up a temp mato and a stand. I took a couple of “junk” arrows to shoot. The plan went well. I did about 6 shots, None hit what I had chosen as a mato, but a couple did come close. I thought I had lost one arrow, but I found it. This was really just a live test to see the flaws in the plan and get a few ideas. As far as that much it was a full success. Even though I did not get a clean hit. Very close ones, but no clean hit. 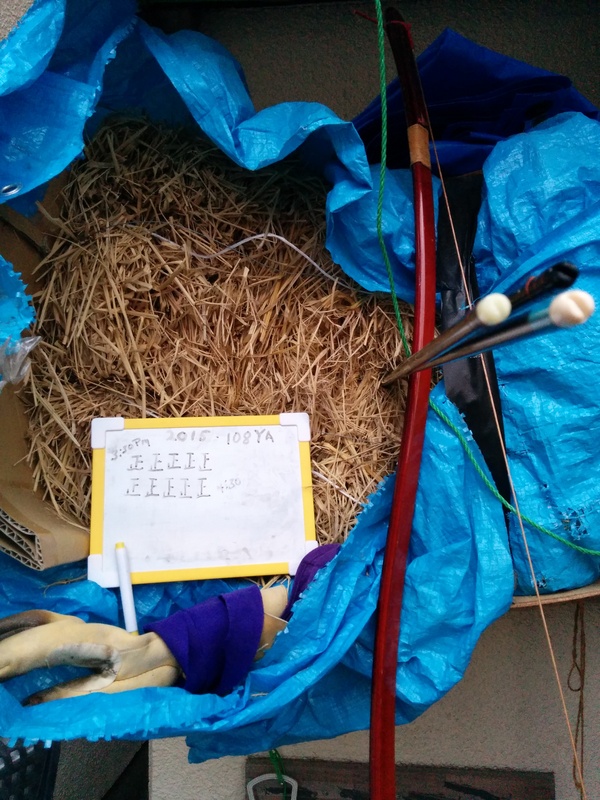 I did get some ideas for improvements, did not lose an arrow, and got in some TaiChi practice. On a nice day the spot will be perfect. I will bring some tea and have a quiet place to practice. Yes, I know my Ashibumi is off. I have been told. I was trying to take a picture! Mostly hidden, fairly clean, the sound of the water fall is right there, as well as the Chi from the water. Once I get things set up I think it will be a very nice outdoor private Dojo. 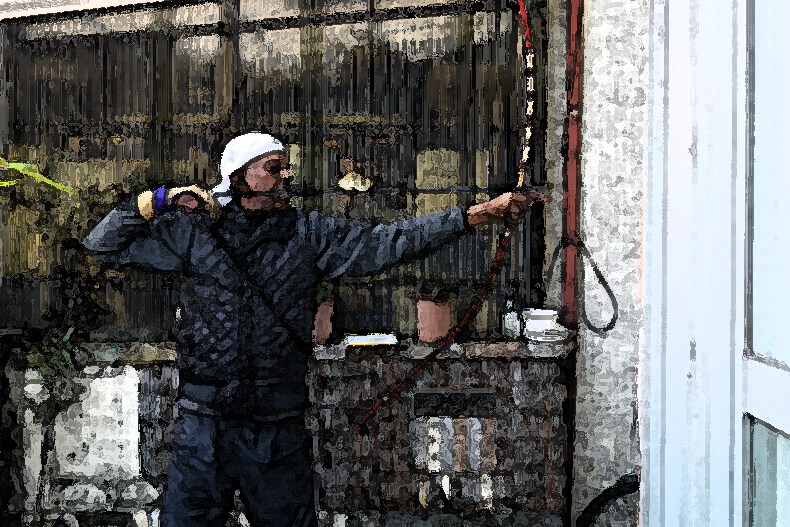 Not only for Kyudo but for my other movement Chan Arts. 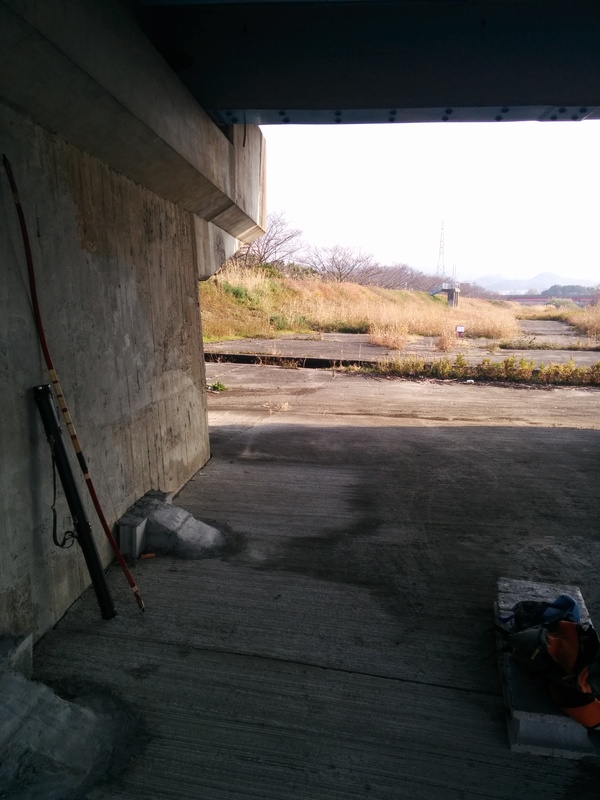 Thinking about it now, it would be also a good place to practice Shakuhachi. Chicago Rock had setup another Super Jam on the 30th. This usually means everyone who has played there is invited to the big Jam. The last time i went i went alone and it was crowded. This time the lads from the band, were going to be there. I was not really expecting to play much, I was going to support the club and do a little advertising for the band and my self. I missed my stop on the train ride, so add that to a bakery stop I made, I ended arriving later than I had said. I did not think it was a big deal. When I arrived it was already fairly crowded as I expected. What I did not expect was my lads already up and playing. I was requested to join it. I thought there would be the usual overload of Bass players. However I was the only one. On a side note, maybe to many Whites, all us Black folks really do look alike. I always get oh, how have you been or something like it has been a while since seeing you, like these people know me when they see me at a club somewhere. Tonight was no different. Some Gaijin says to me, oh you are still here, around, it has been a while…ehhhh?!? I never saw this guy before! I just smiled and kept walking. I forget names quick, but never a face. Oh well, it is at times slightly amusing, just saying. As it turns out my lads’s playing time was up and another group of players are up next to take the stage area, I would play with them. I did not mind, as I wanted to play with some other players, so it worked out well. My guys took a break, I plugged in and got ready for the new dudes. 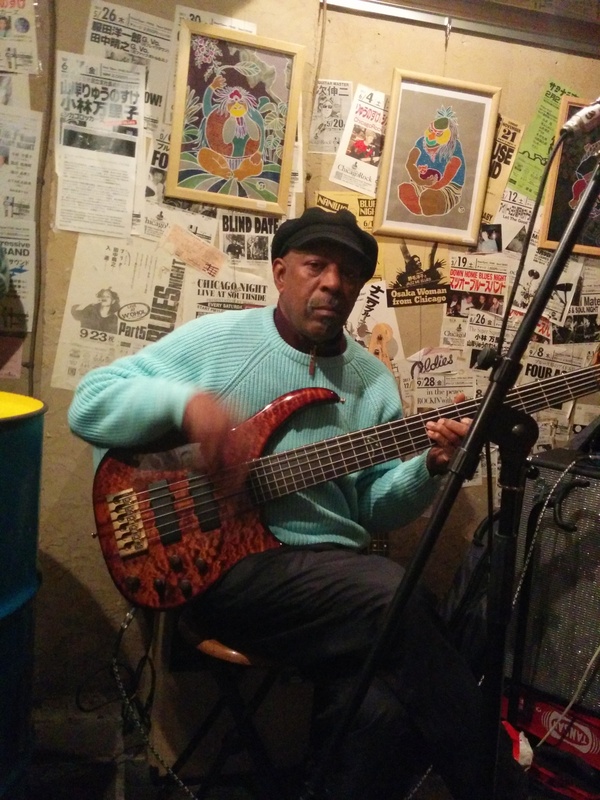 As normal there were harmonica players, so I did not open my Harps and just settled in with my Bass. I played with another trio. Then a couple more players came a keyboardist and a woman singer who also played harp. She was so so, however the keyboardist was good. He introduced himself to me later as ” Rolling Cat”. I had played with him before once, but we did not speak. Also a woman drummer sat in. She was good and solid. I liked her playing, not fancy, just really solid. Better than our drummer. I had seen this woman before with her group. I ended up playing with three or four different sets of people, it was fun to play with better players than usual doing Blues. I did not play with my guys at all and did not care. I heard several times the Doc, say that is “my” Bass player. It was a bit irksome. I was asked to sing, I was not really into it. I did however join in singing with the keyboard on one song, only because my friend/fan had said she only came to hear me as she did the other night. The night rolled on, more people came to play. My guys hung out hoping to play again. I said it is doubtful if that will happen as there are so many waiting their turn. I said I was done and packed my stuff to head home. I did a few short chats on my way out. My purpose was done for the night. I supported the bar owner, I had my presence noticed by other players, I met and played with some new people, a good ending for the musical year. It so weird to play regularly with zip for practice, nada, not even a song list. Sigh, but it is not my call or my name as the leader. I have tried! sigh, I will continue to play with these guys, however I will be keeping my feelers out for other opportunities, such as with the Jazz group and the Kyudo Group or starting, joining another ensemble. I need to keep improving myself and make better music. KInd of like playing the Shakuhachi and seeking that perfect note. 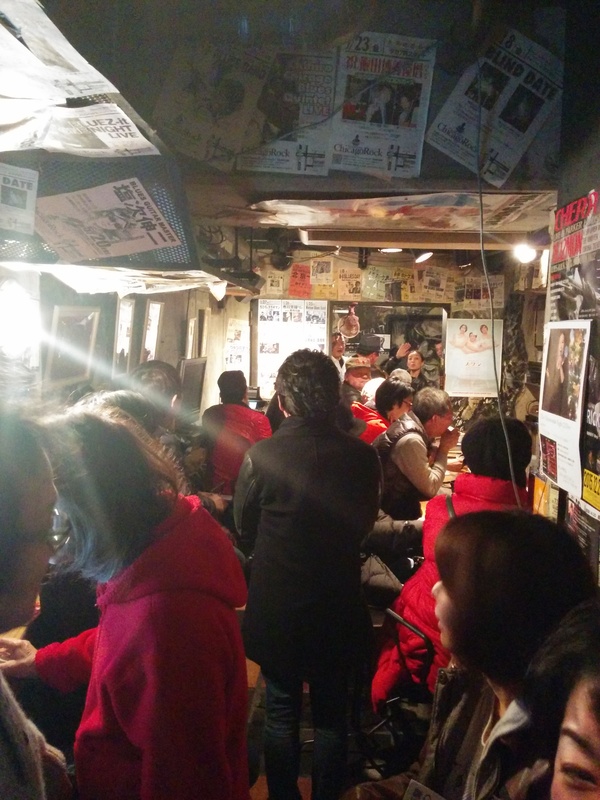 Sadly the people playing the music I mostly like are the Gaijin out in Kobe, which is too far to be practical for me. Oh well, I will play the hand I have been dealt, and flow with the Universe.. This is my cross, my practice, my training…yosh! In the Buddhist world there is the ringing of a bell for 108 strikes symbolizing the 108 sins of man. 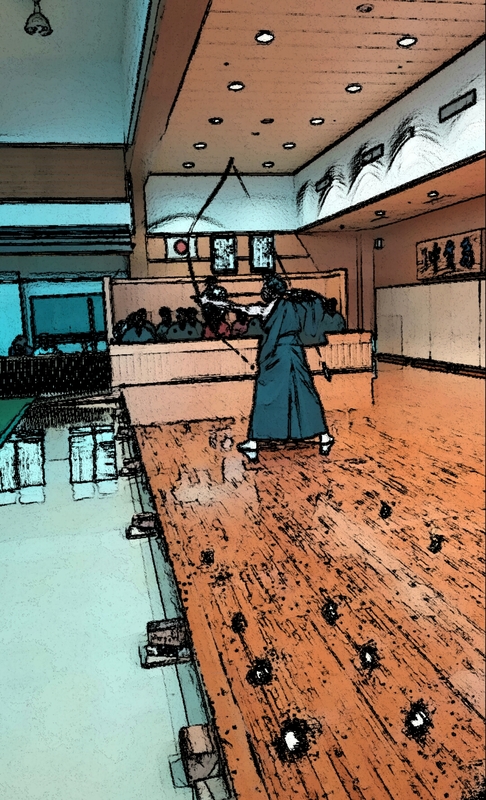 In the Kyudo world among a small following there is the 108 arrow shoot on New Years, usually just before, but some do it just after. No matter it is the spirit of it that matters, and the training. It has been my tradition to do the shoot for the last several years. I missed one while in transit to Japan. 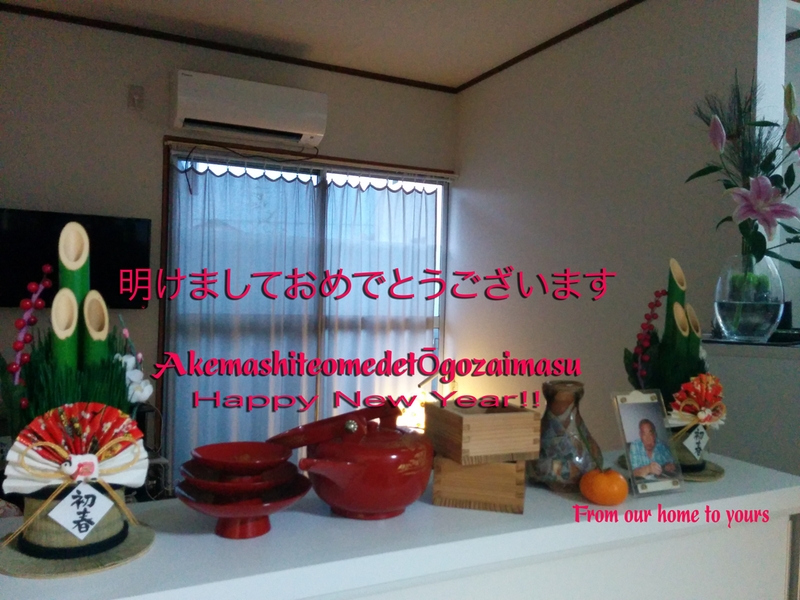 Yesterday, New Years Eve I again had it at the Bamboo Mantis Hidden Makiwara dojo. The weather was fair and mostly sunny for a while. It is an interesting thing to do the 108 shoot. The changes the mind goes through during that period. Starting off really focused on each shot, trying to make it perfect. Then fighting the fatigue, then not trying to rush the process to just get done, resetting the mind to, it is all about the practice. Also there is the mind wandering off to think about the reason of the 108 bells, 108 ya in this case. Next the cold is starting to creep in, one must overcome that. It goes on. It was kind of cool yesterday to be shooting in the semi-darkness of the early evening, and hear the shrine bells from the local shrines. None of them are Buddhist so there was no 108 but even just hearing some bell, set one’s mind off on that direction. 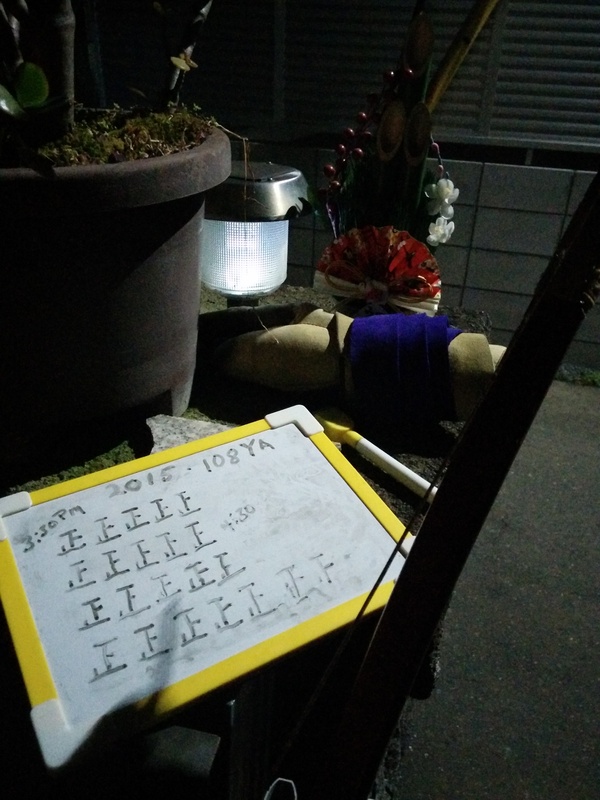 There is also the shooting, looking at one’s errors, tenouchi, arrow level, using the correct muscles, not dropping the arm, not twisting…the list goes on. The training calls, the shinsa creeps closer. Nice thing is now , my neighbors only pay me slight attention now and I can relax while I do it. Another nice things about having this after all this time, is I have or at least can understand the limits of my HomeMade Makiwara. As well as being grateful for the advantages of the having the home setup.